Hello to all my Dare 2B Artzy crafty pals! Hope your long 4th of July weekend was spectacular! Ours was pretty low key as the hubby had to work, so we hung out at home most of the weekend, took in a couple movies and had a wonderful 4th of July BBQ with my parents and best friend. Although I didn’t get my craft room organized as planned, I did get in some crafty time and today I have a fun, easy project to share with you today! At last year’s Scrapbook Expo in Denver, I had purchased some stamps from another company that are made to be water colored. Recently that same company released a frame die as a companion to the square stamps. It’s made to fit them perfectly. Of course I had to have it, but like many of my products that I use, I knew that it could work for a Dare 2B Artzy project. Today I’m sharing my adorable stamped frame. I used the Art Impressions 3-D frame die to create this fun Dare 2B Artzy project. I just love how cute this turned out! Here’s how I created this adorable project. I started off with some Dare 2B Artzy paper. Of course you can use plain, bland, boring solid color paper for this project, but why would you want to do that when you have all the fabulous patterns and colors of Dare 2B Artzy’s papers. For my frame, I chose to use the Diamond Bliss paper from the Modern Bliss collection. I cut the 12 x 12 piece down to be 6 x 6 pieces. This gave me enough room for the die to fit onto the paper. Something to keep in mind, whatever patterned side you would like to make up the front of the frame should be placed face down against the cutting edge of the die when your run it through your die cut machine. After cutting out the paper you simply fold along the two perforated lines on each side to create the frame. Then slide the tabs into the slots through to the back. Once through the slots, you can fold the perforated line on the tab. I used some double sided tape from Elizabeth Craft Design to hold the tabs in place flat against the back. The double sided tape would come in handy later when I added the finished picture to the frame. To add my Dare 2B Artzy stamped images, I cut a piece of Canson 140 lb water color paper into a 6×6 piece. The opening to the frame is 2 ½ x 2 ½ inches, which isn’t a huge amount of space. In order to figure out what stamps were going to work best, I placed the assembled frame on top of my water color paper and traced the center opening with a pencil as well as the outer edges of the finished frame. This allowed me to play around with placement of my stamps. Here’s a quick picture of the little blueprint that I created for stamp placement. I wasn’t sure which stamps I would use to create the picture for my frame so I got out several and began placing them into the square to see which would work best. Obviously, if you want to cover more of the entire piece, a larger stamp would work just fine. I wanted some white space to balance out the paper on my frame. I used the Butterfly Tangle set and the flower from the Blissful Blooms set. With my stamps arranged into my paper, I was ready to stamp them using my MISTI and some Versamark Ink. I made sure to stamp several times to get a clean impression onto my water color paper. Next, I sprinkled on the Ranger Super Fine Detail white embossing powder and heat set it. I was now ready for a bit of water coloring on my background. I used my Zig clean color brushes to color in sections of the flower and butterfly and then used my water color brush and moving the color around a bit more to define the images. I love how fun and bright they turned out. Once the images were dry, I added a bit of a subtle blue to the background to try to give it a sky feel and to further add contrast to define the white embossed images. I added some clear Spectrum Noir Sparkle to the butterfly to give it a bit of shimmer. Once everything was dry, I used an eraser to remove my pencil lines for the picture inside the frame and used the once on the outside to determine where to trim the paper down to. I added some extra double sided craft tape to the inside edge of the frame to make sure it would adhere nicely to the picture. I removed the backing to the tape and placed the completed picture in place so that it lined up with the outer edges of the back of the frame and pressed it firmly into place. The final step was adding the die cut easel stand that comes with the 3-D Frame Die set. It cuts automatically from the negative space when you run the frame die through your machine. I folded the easel along the perforated edges of the stand and added some double sided tape to the spine edge that would be placed against my frame. The easel has one slanted end and one straight end. I placed mine so that the slanted edge would be down at the bottom, but I suppose if you wanted your picture to stand up straight you could flip it so that the straight edge was at the bottom. I lined up the bottom spine of the easel to the bottom edge of the back of the frame and then press it into place firmly. If you used a heavier cardstock or water color paper as I did, you may find that you have to tape the sides of the easel back together to get it to stand up correctly; otherwise it can be too heavy for the easel. For a finishing touch, I added some glossy white dots to the inner corners of the frame. You could certainly go crazy with embellishments like Nuvo Drops, sequins, or even beads for this project and add a multitude of things to the finished frame. Another thought is to leave the easel off and punch a hole in the top of the frame and use it to hang your masterpiece – imagine what cute Christmas ornaments these would make for friends using your favorite holiday Dare 2B Artzy Stamp sets. I bet that put some crafty ideas into some of your heads – I know it did for me!! I really hope that you’ve enjoyed today’s project. 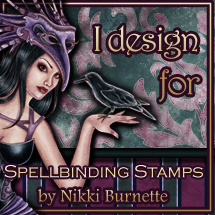 I had so much fun making a project which would showcase these awesome Dare 2B Artzy stamps.